One of the disadvantages of using a computer monitor with a high resolution is that many applications and websites are not optimized for that resolution which in turn means lots of blank space. One way to prevent the blank space would be to use a program to split the monitor into different areas and move selected windows into them. Winsplit Revolution is a split monitor application that can split the computer monitor exactly like the user wants it. It comes with a few default layouts like splitting the computer monitor in half either horizontally or vertically or dividing it into quarters. A nice feature of the program is that it is flexible enough to accept user defined schemes so that the computer monitor can be split exactly like the user wants it. Each scheme can contain various layouts. 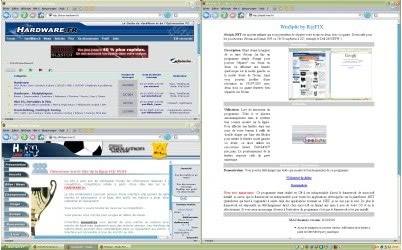 The default left and right theme for instance contains layouts to assign 50%, 33.3% or 66.6% of the computer monitor screen to a window that is moved in the area. The software program is hotkey driven and supports drag and drop as an alternative way of moving windows in the right spot. Hotkeys usually consist of CTRL ALT and the numpad. Pressing the same hotkey a second time alternates between the defined layout schemes. Additional hotkeys are available for various operations like maximizing or minimizing windows. Windows Fusion is another interesting feature. It can be used to move two windows into an exact position on the monitor screen. Winsplit can be installed regularly or as a portable application. It is compatible with 32-bit and 64-bit editions of Windows XP and Windows Vista and requires roughly 8 Megabytes of computer memory while running. A few months ago I developed a small similar program called WinLayou, which does almost everything WinSplit Revolution and akin do, but with a very very small footprint. Does this software allow you to run two PowerPoint presentations, in slide show mode, at the same time?